Electron microscopic studies have revealed that both, neurohumors and neurohormones, are stored within membrane-bound vesicles, which may have different size, shape and electron density. Knowledge about these different types of vesicles may be obtained by the separation of nerve endings from brain and of the synaptic vesicles themselves. Two large groups of nerve endings, one aminergic and containing the various biogenic amines, i. e. acetylcholine, noradrenaline, dopamine, 5-hydroxytryptamine and histamine, and the other, a non-aminergic group, were separated from the brain. The non-aminergic group contains glutamic acid decarboxylase, the enzyme that irreversibly synthesizes γ-aminobutyric acid (GABA). The possibility that GABA may be present in such nerve endings and in the synaptic vesicles, playing a synaptic inhibitory role, is discussed. The isolation of the synaptic vesicles has provided definite evidence that the various neurohumors are contained in quantal units within such compartments of the nerve endings. 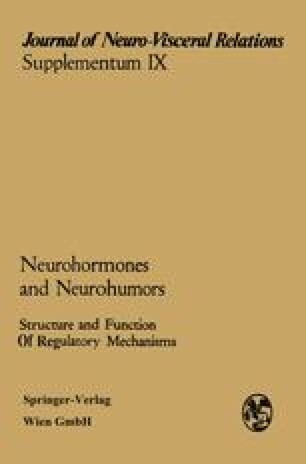 The separation of the nerve ending membranes and of the junctional complex has provided a direct way to the study of the receptor properties and to the isolation of the chemical receptors for the neurohumors. The original research of which this article gives an account was supported by Grants from the National Institutes of Health NB-06953-02 and Consejo Nacional de Investigaciones Científicas y Técnicas, Argentina.